Celebrate lifes most cherished moments with this colorful collection of vibrant, happy gerbera. Theyre the perfect gift for any occasion you want to recognize. 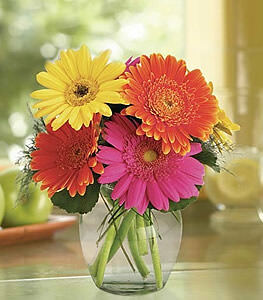 Multi-colored gerbera and simple foliages are delivered in a clear glass vase; colors may vary from those pictured.